The William Faulkner – William Wisdom Creative Writing Competition is sponsored annually by The Pirate’s Alley Faulkner Society, Inc, a non-profit literary and educational organization. Deadline for entry is May 1, 2019. Winners will be formally presented at the 2019 gala annual meeting of the Society, Faulkner for All. The annual meeting and gala will be part of the Society’s traditional Happy Birthday, Mr. Faulkner! weekend. Winners will arrive on Tuesday, September 24 and depart on late afternoon of Friday, September 27. For details, Click Here! A list of manuscripts which have been designated, short list, finalists, and semi-finalists will be posted on the website on or about August 15, 2019. Winners will be announced publicly on September 25, 2019, but notified privately as soon as the selections are made. Please note: Review the guidelines below before entering. The competition is for previously unpublished work only. Self-published and print-on-demand books are considered published unless authors can present current, precise documentation that less than 500 copies have been sold. If a self-published manuscript should win a category, the cash prize offered for that category will be decreased by one third. Considered as published and ineligible are books, stories, essays, and poetry previously published in their entirety on the Internet. Please pay special attention to labeling your entries. We do not read entries in any category without proper labeling. Any entries submitted which show mark-ups of revisions in red or blue from previous drafts will be rejected automatically. No judge wants to review your corrections! Click on the image at right for the 2019 entry form pdf. If you’d prefer an MS Word doc entry form, CLICK HERE. Manuscripts must be submitted electronically in word.doc or docx format to faulkhouse@aol.com. Entries submitted in other formats will be rejected. Each entry should consist of two Word documents. The first document is a contact page with author’s name, address, e-mail address and phone number, category, title of manuscript, and number of words. Important: please title this document with name of author and designation of “contact info”, e.g. “Jane_Doe_Contact_Info.” Do not title it generically such as “author info,” or “faulkner info.” The second document is the actual entry, which consists of a title page with title and category, followed by a one or two-page synopsis (except for the Poetry, Essay, and Short Story by a High School Student categories, which will not include a synopsis) and the manuscript. This second attachment must have no author identifying information on it, as entries are read blind. Important: Please title this document with abbreviated form of title and category, e. g., “Senselessness__Novel.” Do not include author’s name in label. Do not title this document generically, e. g., “Faulkner entry_novel” or “Novel Entry_2018 Faulkner Competition” etc. Pages of the entry attachment should be numbered. No hard copies of manuscripts are required. 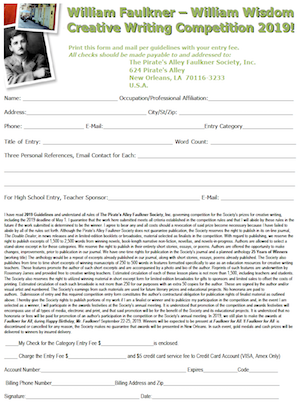 A hard copy of the entry form and the appropriate fee must be submitted by ground mail to Pirate’s Alley Faulkner Society, 624 Pirate’s Alley, New Orleans, LA 70116. Each entry form must be accompanied by cash, a check drawn on a U. S. bank, or a U.S. money order made out to The Pirate’s Alley Faulkner Society, Inc. For entries from abroad send cash, a cashier’s check, or American Express Traveler’s Checks signed over to The Pirate’s Alley Faulkner Society, for the appropriate administrative fee. Please do not send us foreign money orders or checks drawn on foreign banks. We will accept Visa, Mastercard, or American Express credit cards with a $5 per entry processing fee. Each entry also must be accompanied by a completed, signed entry blank, which can be obtained by printing the entry form from the Society’s web site. If you are unable to download the entry form, simply type one out yourself and send it. Alternatively, you may elect to do your complete registration of form, fee, on line. Send entry form separate from manuscript submission. Use our secure or site to pay with credit card. All questions regarding the competition must be submitted to faulkhouse@aol.com. Funded annually by private donors. Requirements: an original novel, previously unpublished. The Society places a word limit of 125,000 words on books within the single entry fee of $45. Writers who wish to submit books of up to 125,000 to 200,000 words must pay a $100 fee. Novels of 200,000 words or more require a $200 fee. The prize will be funded annually by private donors. Requirements: limited to 75,000 words within the limit of a $45 entry fee. Entries over 75,000 words require an entry fee of $75. Entries of more than 100,000 carry a fee of $100; more than 150,000 require a $125 fee; entries of 225,000 words or more carry a fee of $200. Requirements: an original work of creative non-fiction, including non-fiction novels, histories, memoirs, and biographies. The Novella Prize is funded annually by private donors. Requirements: a short work of original fiction, previously unpublished. $40 entry fee. Works of fiction limited to 25,000 words will be accepted in the novella category. The Short Story Prize is funded by private foundations and individuals. Requirements: a short work of fiction of less than 10,000 words. $35 entry fee. This award, created and originally funded by Edgar winner Julie Smith in memory of the late Evans Harrington Grant, a creative writing professor at the University of Mississippi, is now funded by other private individuals. Requirements: highly polished one-page synopsis, and first few chapters or first 25 pages. Entry must not exceed 7,500 words, including the one-page synopsis. Entries may be any form of novel, including literary, mainstream, or genre. $40 entry fee. Entries exceeding 7,500 words will not be accepted. The Shelby Foote Essay Prize is funded annually by private donors. Entry fee is $35. Requirements: original work of creative non-fiction. Essay must not exceed 2,500 words. The Marble Faun Prize for Poetry, created by Adelaide Wisdom Benjamin, is now funded annually by New Orleanian David Speights in memory of his late wife, Marti Speights, who was a member of the Faulkner Society’s Advisory Council. Requirements: single poem of not more than 750 words. NEW REDUCED entry fee: $15. —Manuscripts are to be a minimum of 50 pages to a maximum of 80 pages of original poetry. Poems are to be linked by overall theme or setting. —Manuscript pages are to be numbered. —Please include a table of contents. —Please use a standard, easy-to-read font such as Book Antiqua or Georgia in twelve-point size. —Poems included in the submission may have appeared previously in magazines or anthologies but may not have been previously published in a book-length collection of the author’s own work. —Authors may submit more than one manuscript to the competition for consideration as long as no material is duplicated between submissions. —Each submission will require a separate entry fee of $35. —Manuscripts under consideration for this competition may be submitted elsewhere at the same time. Please withdraw your manuscript if it is accepted by for publication elsewhere and is no longer to be considered for The Marble Faun Prize of the William Faulkner – William Wisdom Creative Writing Competition. A prize of $750 is awarded to the winning student; $250 is awarded to the sponsoring teacher. The Hartwig Moss Prize is funded annually by the children of the late Mr. and Mrs. Hartwig Moss, IV in their memory. Requirements: original work of fiction of less than 2,500 words. Entries must have sponsoring teacher or school, preferably both. $10 entry fee to be paid by school or, in case of home-schooled students, by teacher. The overall general guideline is “ready for publication” with some publisher editing. The Society reserves the right to withhold award of a prize in any category in which there are no entries deemed “ready for publication” by the judges. The William Faulkner – William Wisdom Competition is open to all writers anywhere working in the English language. Although foreign residents are welcome to enter the competition, transportation to and from areas outside the continental United States is not paid the Society. For foreign residents selected as winners, the Society will pay transportation from one of these U. S. airports of entry: New York, NY, Washington, DC, Atlanta, GA, Miami, FL, Houston, TX, Chicago, IL or Dallas, TX. All manuscripts entered must be unpublished works of fiction, non-fiction or poetry as of postmarked date of entry. Should a manuscript be published in any form after it is entered or should a contract or plans for publication be negotiated or announced during the competition period, the entry will not be disqualified. As a major goal of the Society and the competition is publication, however, the cash prize will be decreased by 33 per cent. A work will be considered previously published if more than 25 percent has been published in any form. Self published or on-demand works will be considered published, unless the author presents an official statement that less than 500 copies have been sold. Such manuscripts are not accepted in book format. If a self-published manuscript should win a category, the prize for the category will be decreased by one-third. Works from which brief sections have been excerpted for quotation in literary journals, news journals, broadsides will not be disqualified. Manuscripts published in their entirety on the Internet are considered published, regardless of where on the Internet a manuscript appears. Any suspected plagiarism discovered and confirmed will immediately disqualify a manuscript, regardless of when discovered, even if the plagiarism is discovered after a manuscript’s author has been notified that he or she is the winner. The work of finalists is examined carefully for lack of originality. Please do not send us your collections and expect us to select one piece as the entry. Poets! Do not send us multiple poems and expect us to select one. Each entry is a single poem accompanied by a separate entry form and check for entry fee. Electronic entries will consist of attached material. Do not embed entry material in the body of the e-mail message. co-authors, the cash prize is divided, not multiplied, although two medals would be awarded. We do not select ties. As of 2018, the Society’s Board has voted and confirmed that there will be one winner, one runner-up for each category. The prize in each category is a published cash prize and a gold medal. Any enhancement of the prizes, such as travel and accommodations for out of town winners or manuscript critiques, is solely in the discretion of the Society and such enhancements depend solely on availability of revenues. In the event that revenues are available the Society will pay up to $500 for transportation (either airfare or mileage) and up to three nights in a hotel. Winners and other interested writers will have the opportunity to have work critiqued by an agent and an editor during the 2018 Happy Birthday, Mr. Faulkner! weekend September 22-25. If, for any reason—including cancellation for reasons of approaching heavy weather—an awards gala is not possible, cash awards, and gold medals will be presented to winners by express delivery service. The Society reserves the right to reject all finalists if the manuscripts are deemed to be deficient, not meeting the Society’s basic overall guideline for pre-round readers, “ready for publication with minor editing.” Preliminary judges rank a manuscript from one to ten. Any manuscript receiving a ranking of five or less will be eliminated from subsequent rounds. Only manuscripts receiving rankings of eight, nine, or ten will be considered for the ranking of finalist, with the possibility of being selected for Short List, winner, or runner-up. The Society reserves the right to use any presentations made by authors at awards ceremonies for future promotion of the Society and for the benefit of its projects. Transportation within the continental United States and hotel accommodations for the awards event for out of town winners may be paid by the Society. Travel and hotel accommodations are not provided for winners who live in metropolitan New Orleans. The Society does not make cash or gold medal awards to runners-up, short lists, other finalists, or semi-finalists. Free tuition registration for Happy Birthday, Mr. Faulkner, 2018— which include manuscript critiques by leading editors and agents—may be awarded to Runners-up. We reserve one-time rights to publish the work of Winners and Runners-up in our on-line literary journal, The Double Dealer. Short List Finalists may request publication and we will consider their work. Currently, our web site for the journal, DoubleDealer.org, is down for reconstruction. We expect it to be up by mid-summer, 2018. 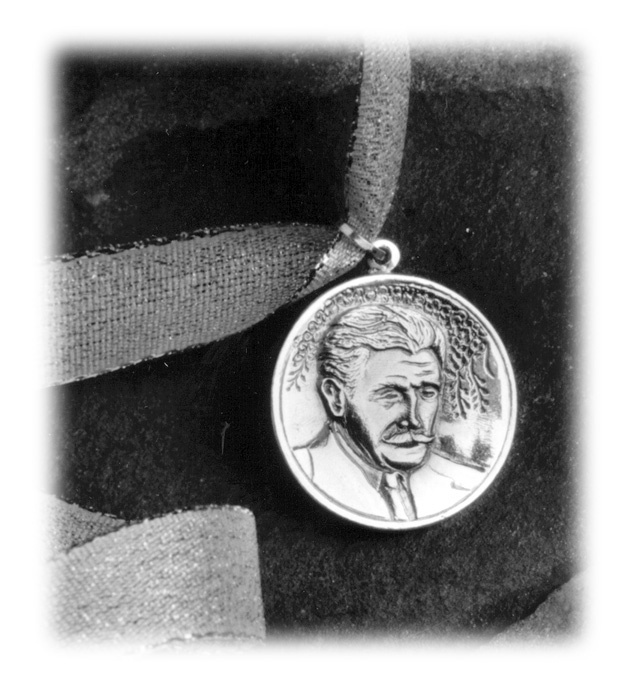 Faulkner Society winners will be presented their awards during our Happy Birthday, Mr. Faulkner! Weekend. Although the Pirate’s Alley Faulkner Society does not guarantee publication, the Society reserves the right to publish in its on-line journal, The Double Dealer, in news releases and in limited-edition booklets or broadsides, material selected as finalists in the competition. With regard to publishing, we reserve the right to publish excerpts of 1,500 to 2,500 words from winning novels, book-length narrative non-fiction, novellas, and novels-in-progress. Authors are allowed to select a stand-alone excerpt for these categories. We reserve the right to publish in their entirety short stories, essays, or poems. Authors are offered the opportunity to make changes, improvements, prior to publication in our journal. We have one-time rights for publication in the Society’s journal and a planned anthology: 25 Years of Winners (working title) The anthology would be a repeat of excerpts already published in our journal, along with short stories, essays, poems that are already published. The Society also publishes from time to time short excerpts of winning manuscripts of 250 to 500 words in features formatted specifically to use as an education resources for creative writing teachers. These features promote the author of such short excerpts and are accompanied by a photo and bio of the author. Reprints of such features are underwritten by Rosemary James and provided free to creative writing teachers. Estimated circulation of each of these lesson plans is not more than 500. The Society also has published limited-edition broadsides for gifts to sponsors and limited sales to offset the costs of printing. Estimated circulation of each such broadside is not more than 250 for our purposes with an extra 50 for each author. These are signed by the author and or visual artist and numbered. The Society’s earnings from such materials will be used for future literary prizes and for the Society’s educational projects. No honoraria are paid to authors, other than the cash prizes designated for winners of each category. Submission of entry and required competition entry form constitutes the author’s contractual obligation for publication rights of finalist material as outlined above. Fees offset some of the administrative costs of the competition, including copying and deliveries to preliminary readers and judges; travel and housing expenses for out-of-town winners and judges; and gold medals awarded to winners. We no longer accept hard copies of manuscripts, so please do not send original hard copy manuscripts as they will not be returned. The Society is an all-volunteer operation and we cannot guarantee to correspond individually with each person entering the competition. If you wish to have confirmation of receipt of your manuscript, enclose a self-addressed, stamped postcard with entry form and check. The return of the postcard will be your confirmation. Please do not attempt to send us entries by fax. We do not accept such entries. We no longer even have a fax! Winners in one competition year will not be eligible to win again in the same category. Work for different categories, however, will be accepted from previous winners. Entries rejected in one competition year will be eligible for re-entry in subsequent years with significant revisions if accompanied by a letter explaining briefly how the manuscript has been revised. All winners will be posted on our web site by October 1 of the competition year. The competition is operated on the honor system. Should it become necessary to revoke a prize because rules are broken, all necessary costs will be borne by the offender. Should plagiarism be discovered after award of the prize, for instance, the offending winner will return cash prize and medal to the Society. Manuscripts are submitted blind for judging by professionals in the fields of editing, publishing, writing, and literary academics from major university English Departments. We strongly suggest that authors have their work read by disinterested third parties for purposes of correcting spelling, grammar, and typographical mistakes, prior to finalizing entries. We also strongly suggest that authors give major attention to beginnings and endings, sense of place, character development, dialogue, transitions, and most especially narrative voice, as our experience has been that these are the areas which preliminary judges focus on when selecting work to progress to final rounds. First Round Review. Preliminary judges review all manuscripts. If your manuscript is not eliminated in this round, it is re-read by different judges in a second round. Second Round Review. If your manuscript is not eliminated in the second round of judging, you are designated a semi-finalist and your manuscript is read again. Third Round Review. If your manuscript is not eliminated in the third round of judging, you are designated a finalist and your manuscript is sent to to a new judge, who selects the Short List from the finalists. Fourth Round. If your manuscript is selected for the Short List, it will be sent to the person designated as the final judge, who will select the winner and runner-up. Preliminary judges are anonymous. Final round judges are well known writers, editors, or agents. Finalists are announced as each category’s judging is completed. They will be posted by name of manuscript only on our web site, as judging is blind. At the same time, we will post semi-finalists by name of manuscript and name of author. We announce winners publicly at Faulkner for All. Winners will be alerted as soon as we know their names, however, and we will send out an e-mail to announce winners to all who entered and who provided an e-mail address. If you should change any of your contact information after entering, please notify us by e-mail with your new info. Information about winners also will be posted on this web site not later than December 31, 2018. We prefer that you do not call us. Use the phone only as a last resort. We are an all-volunteer organization with no full-time paid staff. We, therefore, urge you to e-mail your questions. We do not accept material of any sort or queries by fax for the competition. E-Mail: faulkhouse@aol.com, Mail: Faulkner – Wisdom Competition, 624 Pirate’s Alley, New Orleans, LA 70116. Don’t forget to send your check and entry form together. Drop Dead Deadline for postmarking your entries this year, May 1, 2019. Early entries to competition are encouraged and earlier entries are most likely to be better matched with the most appropriate pre-round readers. Lists of previous winners may be found by visiting this web page. The Peauxdunque Writers Alliance of New Orleans, which was created as a result of the Faulkner Society’s 2011 Words & Music Writers Alliance initiative, has begun staging its own literary competition and has named it Words & Music Competition. Please note that this new competition has no connection to the Faulkner Society or the Faulkner – Wisdom Competition except for the facts that some of Peauxdunque’s most talented writers have won or placed in the Faulkner – Wisdom Competition. The late Terri Sue Shrum, along with Emilie Staat, and Maurice Carlos Ruffin, have been gold medal winners, while Tad Bartlett and J. Ed Marston have been short-listed or finalists several times and Emily Choate and Alex Johnson have been a finalists. Entering the Words & Music Competition does not mean your work will be entered or judged in the Faulkner – Wisdom Competition…and vice versa.